Hebei Raja Iron Craft Products Co., Ltd. was founded in 1999, has developed into a larger scale, advanced equipment and technology leader. From the preparation techniques, the pipe steel wire spray techniques, to hand-forging process, we have more than 100 high-quality professional designers and technical staff, the main forging craftsmen are practicing for 30 years, skilled, dedicating themselves to process innovation, by virtue of "customer first, reputation first" purpose of winning the majority of customers support and trust, in the endless road of art, strive to innovate to bring you a truly fine iron. 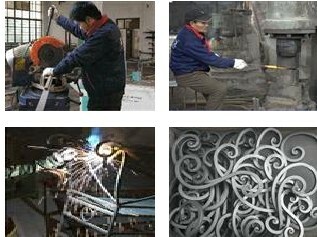 Company's main products include iron garden products, fireplace tools, garden tools, hand forging process products, security windows, balcony railings, wall fences, stair railings, garden gates, wrought iron furnitures, iron flowers, fence parts, doors, windows, flowers fews, floor screens and other decorative crafts, all kinds of wire mesh, series of nearly one hundred categories, thousand kinds of products.